By Dave Saldana, Director, Writer, and Producer of “Keystone PipeLIES Exposed,” a new short film that is a production of the Center for Media and Democracy Investigative Fund. The proposed Keystone XL pipeline would cover 1,179 miles, from Hardisty, Alberta, Canada, to the refineries of Port Arthur, Texas. Its name, Keystone, is no accident. Its 36-inch diameter, 830,000 barrels-per-day capacity is believed to be the sine qua non of maximal development of the tar sands, for without a reliable, cost-efficient conveyance to transport the product from Alberta’s tar sands to refineries with access to international shipping terminals, the oil producers simply cannot make enough profit to make tar sands extraction worthwhile. And that is why TransCanada, the Canadian corporation had earmarked $5.4 billion of its $49 billion in assets in the project, which it initially expected to be complete by 2012, with plans presently to invest $7 billion total, pending approval by President Barack Obama. Because the pipeline would cross an international border, President Obama has sole authority to accept or reject the deal during his administration. And that is why TransCanada is willing to spend so many millions to persuade the president to green-light the controversial project. This is far from TransCanada’s first foray into high-capacity, long-distance pipeline development. The company’s website boasts of nearly enough natural gas pipelines to circle the globe twice, and enough to move 15 billion cubic feet of gas per day, and 13 ongoing petroleum pipeline projects. Phases I and II of the Keystone project are already operational, currently distributing up to 590,000 barrels per day of semi-processed tar sands oil to Cushing, Oklahoma, and Patoka, Illinois. The January 2014 opening of the southern section of the pipeline — from Cushing to Port Arthur, Texas — is another important step to the goal. But the chief objective remains building the northern branch, granting access for maximum capacity to the global market that comes with international shipping capability. Without that access, the high costs of extracting, processing, transporting, and refining tar sands petroleum to maximum capacity simply would not be worth it. “Producers up in Alberta want to get to the Gulf coast so they can expand their market and raise the price that they get,” says Lorne Stockman, research director for Oil Change International. Stockman has written extensively on the Keystone XL pipeline (KXL), particularly on how basic economic pressures compel oil producers to seek markets beyond North America. “Right now, they’re taking a discount because they’ve flooded all the markets they can reach in the Midwest [with phases I and II of the Keystone pipeline],” he says. Those 590,000 daily barrels can only travel so far from Cushing and Patoke before the costs of shipping them denudes the entire profit margin. Tyson Slocum, director of Public Citizen’s Energy Program, explains that shrinking domestic demand is the other market force driving tar sands producers’ drive to the coast. “Gasoline and oil demand has plummeted in the U.S. We’ve taken two million barrels of oil off the market each day since 2008,” Slocum says, because of less economic activity in the Great Recession, and by Americans’ efforts to use less fuel and energy in response to high prices. Indeed, the Christian Science Monitor reports that U.S. demand for oil dropped in six of the past seven years. For environmentalists, widespread conservation is great news, whatever the cause. And for tar sands oil producers, high prices are more a necessity for their own survival than merely a matter of greed. Pulling oil from the very soil is a much more difficult and expensive process that just digging a hole in the ground. Tar sands oil bears little resemblance to anything most people would recognize as petroleum. In its natural form, it is not even liquid. Rather, it is solid or semi-solid bitumen, mixed with clay, sand, and water in a sticky sludge. “It basically is a very tarry, asphalt-like substance that requires an enormous amount of energy to get out of the ground and an enormous amount of energy to move and to refine,” says Anthony Swift, staff attorney with the Natural Resources Defense Council (NRDC). “It’s a much lower grade of oil, almost liquid coal. There are many more impurities there are many more toxic substances in it” compared to conventional petroleum. Tar sands extraction is generally done in two ways: surface mining and drilling. Keystone PipeLIES Exposed – Opener from Center for Media and Democracy on Vimeo. Surface mining is similar to the commonly understood form of mineral extraction. Much like a gold mine or coal mine requires digging into the earth to uncover the valuable minerals held within, tar sands mining differs only in the vast areas that must be cleared and the vast amounts of earth that must be dug up to remove the bitumen. Drilling for tar sands, however, is very different from any other form of oil drilling. Rather than poking a giant straw into an underground reservoir that then gushes up under pressure or is pumped to the surface, the bitumen locked in the soil is too thick to be pumped in a similar fashion. Drilling for bitumen, typically undertaken when the tar sands are too deep beneath the surface for cost-effective mining, requires a multi-step process. First, a collection tube is drilled. And then above that an injection tube is drilled, which then forces superheated steam into the earth under extreme pressure, which heats and liquefies the bitumen which is been collected by the first tube. Each process has its own significant drawbacks. Most obviously, surface mining requires a level of industrial activity on a delicate ecosystem that many people likely would find unconscionable. At first glance, drilling seems like a far less disruptive. Rather than digging an enormous pit stretching for miles, the drilling process is comparatively low-impact, requiring less of a footprint as much of the work of separating the bitumen from the sand happens underground. But its impacts are much more than meets the eye. As yet, there is no plan to stop the spill, because according to one government scientist, nobody knows how to stop it. It may simply continue to flow until the oil runs out. Perhaps more troubling than the oil that seeps to the surface is the oil that migrates underground. Leaders of the Cold Lake First Nations (as aboriginal Indian tribes are known in Canada) have expressed concern that oil could contaminate underground aquifers. “It’s not so much the surface spill, that can be cleaned up. But you can’t control what happens underground, that’s a different story,” Cold Lake First Nations councillor Walter Janvier told The Edmonton Journal. Janvier says Cold Lakes First Nations wants a moratorium on the steam-injection method until a full technical assessment as to its safety is conducted. After the bitumen is taken from the ground, it must be processed into synthetic crude before it can be transported to a refinery. The first step is heating the bitumen/clay/sand mixture so the solid matter separates from the oil. The tar sand is mixed with hot water, and is then agitated, causing the bitumen to rise to the top, where it is skimmed and further processed to remove all remaining contaminant particles. The water is then sent to a tailings pond, where the particulate matter sinks to the bottom, and the water at the top is removed and reused. While it appears to be a simple matter of lather-rinse-repeat, the sheer volume of water required by the process makes it environmentally problematic. Though the Canadian Association of Petroleum Producers asserts the totality tailing ponds in tar sands covers just 67 square miles, the Sierra Club’s Colarulli counters that they are large enough to be seen from space. Others who have witnessed the tailing ponds firsthand say that they are anything but a pleasant experience. In addition to being extremely large, the tailing ponds are also extremely difficult to manage. Alberta’s Energy Resources Conservation Board has called out tar sands producers for failing to meet goals to reduce the proliferation of tailings ponds. The total of tailing pond capacity in Alberta is presently 925 million cubic meters, up from 725 million cubic meters four years ago. The tailing ponds are so toxic, producers are required to use cannons, flare guns, and other alarms to scare away wildlife that might approach the tailings pond. However, sometimes those measures are not enough or fail to function. The resulting failure leads to the deaths of thousands of animals, particularly ducks and other waterfowl. Even absent the problem of toxic tailings, tar sands production causes severe water usage problems. Pembina notes that almost none of the water use in tar sands processing is returned to the natural water cycle. This is particularly striking because so much water is used, approximately three barrels of water for every barrel of oil produced. With nearly as much water being used by tar sands producers as the residential usage of 1.7 million Canadians, the Athabasca River, which supplies the water used in tar sands production, is suffering. As the Athabasca is a habitat for many of Alberta’s native fish species, the fact that tar sands producers are licensed to withdraw and use 15% of the river’s water flow could have calamitous impact on the river’s ecosystem as well as the First Nations, anglers, hunters and tourism industry who rely on the fish and wildlife. Once the bitumen is separated from the solid matter and water, it must be prepared for transport. This involves mixing the bitumen, which is about the consistency of peanut butter in its unaltered state, with lighter oils and solvents. Though the particular cocktail of substances used to dilute bitumen, commonly known as diluents, are considered proprietary company information, it is widely known that they generally include the carcinogen benzene. Without this processing, the bitumen would be simply too thick to move. The resulting product, diluted bitumen, or “dilbit,” is roughly the same consistency as conventional crude, allowing it to be pumped and shipped in similar ways. The sheer volume of petroleum products produced from the Alberta tar sands leaves few options for shipping them from their land-locked location. The number of trucks required to ship enormous volumes of oil, not to mention the inherent danger with driving them over tens of thousands of miles of crowded roadway, makes them completely unfeasible. That leaves rail and pipeline as the only viable options. Canadian railroad company CN, not surprisingly, advocates for using rail to transport the product from tar sands producers to refineries. It asserts that using trains to move the product is actually less carbon intensive than the KXL project would be. Transporting oil by rail has surged in popularity in the US in light of the fact that current US oil production exceeds the capacity of existing pipelines. And while shipping by pipeline is less expensive than shipping by rail, rail offers a much wider array of delivery options, allowing producers to send their product where they can get the most return rather than limiting them to just those refineries at the end of the pipeline. However, transportation by rail has its own, often spectacular dangers. Nowhere is that danger more obvious than in the eastern province of Québec. On July 6, 2013, a freight train hauling oil derailed in the town of Lac-Megantic. The cargo exploded and burned, killing 47 people in Canada’s worst rail accident in over a century. In addition to the loss of life and the homes and businesses destroyed by the explosion and fire, environmental groups — and the railway operator itself — say that cleaning up the toxic mess left behind probably will exceed $200 million. The Canadian ambassador to the U.S. has used the prospect of more trains carrying oil across the country as an incentive for President Obama to approve Keystone XL, saying that, one way or another the oil will make its way to market. In light of the Lac-Megantic tragedy, the ambassador’s words bear more than a hint of threat. Despite the dangers and expense of delivering oil by rail, the U.S. railways are doing brisk business in the market. Between 2009 and 2011, the Union Pacific railroad saw its annual oil-transporting traffic increase sevenfold to 37,000 carloads, each totaling 725 barrels. The Quebec accident, however, could put a damper on Americans’ enthusiasm for trains hauling oil through their communities. Given the costs and hazards of transportation by rail, transporting tar sands oil by pipeline seems the more reasonable solution. They clearly have shown that they are feasible and effective, and the Association of Oil Pipelines says that from 2006 to 2008 there were only 0.7 safety incidents per thousand miles of pipeline. But with 55,000 miles of petroleum pipelines crisscrossing the country, that still amounts to 38 pipeline spills in a three-year period, or roughly one a month. And each one is worse than a railway spill. The inability of pipeline alarm systems to quickly recognize a leak and alert pipeline operators makes every leak a potential, if not actual, disaster. The Wall Street Journal reports that the technology pipeline operators rely upon to learn about little problems before they become big problems are highly unreliable. The robots, called “smart pigs,” that snake their way through the pipelines looking for fissures in the pipes have problems spotting them, according to the report (subscription required). Case in point: an ExxonMobil pipeline reportedly was scanned just a month before a 5,000-barrel spill caused by cracks in the pipe. In sum, the high-tech gizmos that are supposed to keep oil out of groundwater just don’t work very well. More troubling, it appears that construction already underway on the pipeline could be something less than faultless. Activists who locked themselves inside the pipeline under construction in Texas claim they found pinholes of light leaking through poorly welded seams in the pipe, and they produced photographs as proof. Public Citizen reports dozens of problems, including dents and welds, with segments of KXL pipeline already laid in southern Texas. These findings bolster claims by a former TransCanada engineer who was fired by the company after reporting faulty welding practices to Canadian regulators. 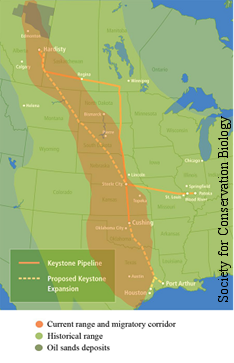 KXL could be following in the footsteps of its predecessor, Keystone Phase I, which is already operational. TransCanada assured that it would leak once in seven years (as if that were an acceptable level of contamination), but as this DeSmogBlog reports, it sprung 12 leaks in its first year, spilling as little as a few gallons and as much as 500 barrels. That kind of risk becomes even more enormous when one considers that the proposed KXL route would extend from the Canadian border in Montana to the Gulf Coast at Port Arthur Texas. Although the pipeline’s exact route is unknown to anybody other than TransCanada, it’s certain that the pipeline would cross some of the most important farmland and ranch land in the country. In addition to that, it would cross one of the most vital freshwater sources in the country, the Ogallala aquifer. The Ogallala aquifer contains about fifth of the United States freshwater supply. It runs through eight states, from South Dakota and Wyoming in the north to New Mexico and Texas at its southern end. Approximately 8,000,000 people rely on it for fresh drinking water, along with untold numbers of farms and cattle ranches. With so much at risk, farmers and ranchers in the breadbasket of America have become environmental activists unlike any you might recognize. “According to the State Department’s own information, a pinhole leak could release an amount of benzene that could contaminate enough water for 2 million people to drink for up to 425 days,” said Ben Gotschall, district president of the Nebraska Farmers Union, at a public hearing. “There has not been a worst-case scenario analysis on the Ogallala aquifer, the Platte River, the Niobrara River, the countless family wells,” said Jane Kleeb of Bold Nebraska, a grassroots organization opposed to KXL, at the same public hearing. For family farmers, the worst-case scenario is not merely contaminated water, though that is certainly a crisis of epic proportions. A much greater risk for farmers is losing everything they have. “Their property will have less value when a spill happens. This is at glance. Just like those folks in Arkansas, we can’t sell our land, sell the home back to Exxon. We can’t just sell our home back to TransCanada. This is land that’s been in families hands for over 100 years,” Kleeb said. Have You Heard of the Mayflower (Disaster)? The Arkansas families Kleeb referenced are the test case for what happens when an oil pipeline ruptures. Keystone PipeLIES Exposed – Spills from Center for Media and Democracy on Vimeo. 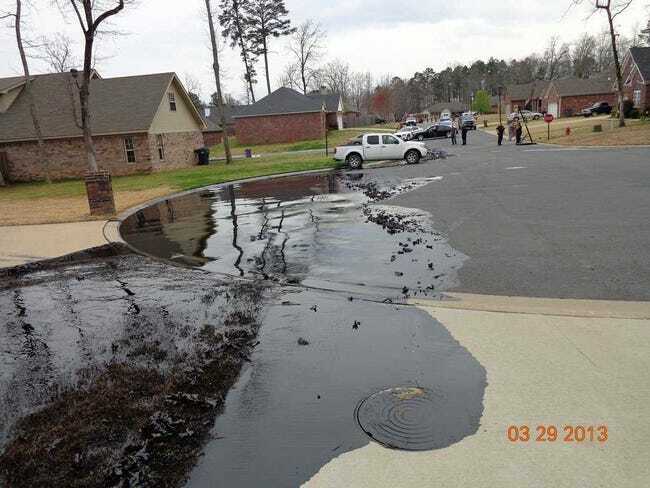 On March 29, 2013, and ExxonMobil pipeline had what the Environmental Protection Agency classified as a “major spill.” Twenty-two homes had to be evacuated in the town of Mayflower, located about 25 miles northwest of Little Rock, to protect their inhabitants from hundreds of thousands of gallons of tar sands oil gushing through their neighborhood. Even after the EPA declared the air quality safe enough for families to return, very few have taken that step. In fact, a cursory check of a real estate listing site shows dozens of homes listed for sale in Mayflower, most clustered around the now-polluted Lake Conway. Perhaps more disturbing, records indicate that ExxonMobil was aware that the pipeline had problems that made it highly susceptible to rupture. And yet, the company added stresses to the pipeline that made rupture even more likely. That and many other indignities, not to mention violations of state and federal law, prompted the state of Arkansas and the federal government to sue ExxonMobil. Among the claims in the suit, the state asserts that the cleanup of the spill site consisted of removing petroleum soaked mud, word, concrete, and other debris and storing it in an uncontrolled, unpermitted site. If the experience of Michigan residents near the Kalamazoo River is any indication, lives likely will be disrupted for years, and cleanup costs could grow into the billions. The Kalamazoo River has been fouled with tar sands oil for more than three years following the rupture of a 30-inch diameter crude oil pipeline. More than 800,000 gallons of the sticky, black sludge spilled into the river near the town of Marshall, Michigan, on July 25, 2010. The National Transportation Safety Board found that Canadian pipeline company Enbridge, which owned and operated the pipeline that ruptured, ignored evidence of cracks, and that its engineers ignored the leak detection system’s alarms for 17 hours until an outside caller informed them their pipe was hemorrhaging oil. Since then, Enbridge has spent more than $1 billion trying to clean up the mess from roughly 40 miles of the river. Sadly, the cleanup still goes on, with dredging operations underway to remove contaminants from the river’s bed. With costs for cleaning up spills so staggeringly high, one might reasonably assume that oil pipeline operators have insurance of some sort to cover costs they cannot afford to pay. And it is true; pipeline operators pay a few cents per barrel into the Oil Spill Liability Trust Fund to defray cleanup costs. And given that dilbit is so much more difficult clean up, since its density causes it to separate and sink in water rather than float on the surface, one might reasonably assume that tar sands pipeline operators would be required to pay a little bit more. Regardless of who pays for it, the notion of cleaning up of an oil spill is essentially delusional. There are conflicting opinions as to whether dilbit is more or less likely to cause pipeline ruptures. The National Academy of Sciences’ National Research Council reported that dill bit is no more likely than conventional oil to cause damaged pipelines. However, as Swift wrote in his NRDC blog, “The NAS literature review compared tar sands to similar heavy thick crudes coming from Canada that have similar properties and risks, rather than comparing them to the lighter oils historically transported in the US pipeline system.” So the NAS review found that tar sands oil behaves very much like oil that’s very much like tar sands oil. 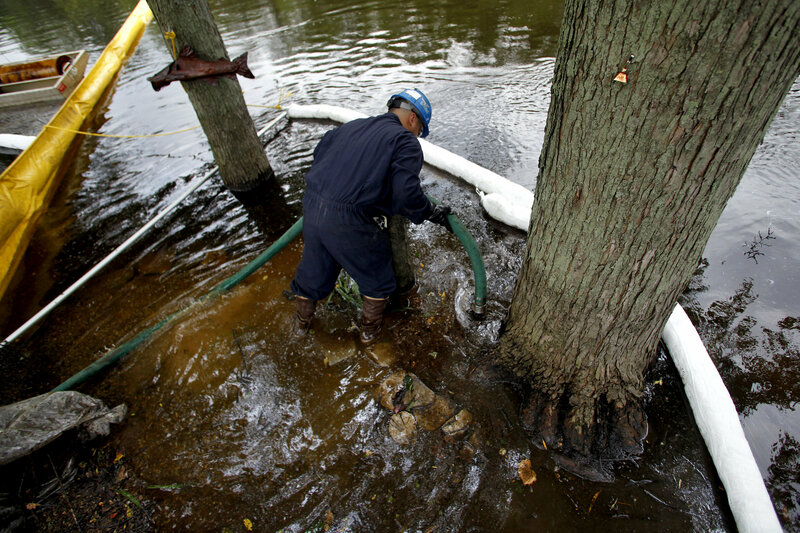 Catastrophic as they may be, spills are an unintended consequence of tar sands development. Another major environmental hazard from the process is expected, and in some quarters, desirable. Petroleum coke, or pet coke, is a byproduct of the refining process. As a cheap substitute for coal, it can be used to fuel power plants. But with tar sands’ higher contaminant content, and the fact that more than 6 million tons of it are produced annually, pet coke is another environmental catastrophe waiting to happen. The catastrophe occurs not only when the pet coke is burned, spewing massive amounts of carbon, sulfur, and other pollutants, but as we’ve seen in Detroit, when it is stored and stockpiled. Those black piles were petroleum coke, and from the time they first appeared shortly after the nearby Marathon Petroleum oil refinery began processing about 28,000 barrels of tar sands oil daily in November 2012, they eventually comprised a mound three stories tall and stretching for an entire city block. Shockingly, the pile was almost entirely uncontrolled, i.e., little if anything was done to control for wind and water runoff. In fact, the company that stockpiled the pet coke never even got permits to store it. With no government regulators to take up the task, Tlaib’s constituents, generally low-income people of color, took it upon themselves to document the damage the pet coke was doing to their community. “We confirmed that the petroleum coke was on the sidewalk, and on people’s windowsills that live nearby. We have 767 people who got their homes tested, and all can confirm petroleum coke containing two metals, selenium and vanadium, that can cause serious respiratory disease,” Tlaib says. Neighbors took to the streets, but their protests generally were met with indifference from the city government. Perhaps it is because they are mostly poor and minority residents who are frequently marginalized by the political process. Or, maybe it’s because the coke piles are owned by Koch Carbon, which is owned by the extremely rich, extremely powerful Koch brothers. But whatever the reason, the city did not take action to shut down the coke piles, despite evidence that rainfall runoff from them was getting into the Great Lakes watershed, and toxic dust was contaminating the neighborhood. Until, that is, July 27, 2013, when disturbing video evidence showed a massive plume of pet coke dust rising over the Detroit River and hovering over Canadian territory in Windsor. The video was shot by Randy Emerson, a member of the Canadian environmental group Windsor on Watch. He uploaded the video to YouTube, where it quickly went viral. Within a month’s time, Detroit Mayor Dave Bing ordered that the piles must be removed by August 27, and covered until removal was complete. By that time, however, Koch Carbon had already announced its intention to move the piles to Ohio. Some pet coke has now turned up at a Koch Industries site in Chicago. The pet coke pile in Detroit was the result of a short-term production in one relatively small refinery. What will happen when full-scale refining takes place at the end of a pipeline delivering nearly 30 times the amount? The people of Port Arthur, Texas, are not eager to find out; the oil industry has already given them enough problems. Port Arthur stands at the most southeastern point of Texas, bordered by Louisiana and the Gulf of Mexico. Part of the Golden Triangle outside of Houston, its history as a refining center dates back more than a century, originating in 1901 with the Spindletop oil well in nearby Beaumont. Since then, its landscape has been dotted with refineries. From some parts of town, it’s possible the look out on the horizon and see nothing but oil refineries, including one of the world’s largest. Not coincidentally, Port Arthur’s population suffers from shockingly high rates of cancer, asthma, kidney and liver disease, and other maladies attributable to the toxins in the air that they breathe. “It’s a disproportionate number of people suffering from illnesses. Their respiratory systems are damaged, and also we have some serious skin disorders. Throughout this community, within a one block area there’s been at least three deaths from cancer, and any community you go into within the city of Port Arthur, you can bet if the residence that were once living there passed on, it was probably cancer related,” says Hilton Kelley, a community leader and 2011 winner of the prestigious Goldman Prize (often called the Nobel Prize for environmentalists), naming him as the outstanding environmental activist in North America. Kelley was born and raised in Port Arthur, but left as a young man to join the U.S. Navy, and then went to Hollywood to pursue his acting dream. Despite a successful career, including work on the Don Johnson series “Nash Bridges,” he was compelled to return to his blighted, impoverished hometown. “I came here [to Port Arthur] to visit in 2000, and just took a look around the community. I was wondering why wasn’t somebody doing something to help rebuild this area, to help clean it up. And when I got back on the California I kept thinking about my hometown and the need for someone to help clean it up. And I just made a choice to come back to make that happen,” he says. Since his return, Kelley has created the non-profit Community In-power & Development Association. And in seeking to clean up and revitalize the city, he has become something of a lay expert on the petrochemical industry and what it does to human health. Keystone PipeLIES Exposed – Enviro Racism from Center for Media and Democracy on Vimeo. Kelley often hears critics say about the residence of Port Arthur, if it’s so bad why don’t they just leave? But the fact is, he says, the people who remain in Port Arthur are generally the poorest of the poor. With 25% of the city’s population living below the poverty line and nearly one-fifth unemployed (bearing in mind the official unemployment rate only counts those who are out of work and are actively seeking employment, excluding the chronically unemployed and part-time workers who would prefer full-time employment), seven out of 10 homes worth less than $50,000, the evidence supports Kelley’s position. “Economically, this community is very stressed. We have 16-, 17-percent unemployment. Those people that are employed, they are working two or three mediocre jobs fighting to keep the lights on because a lot of the jobs are paying $7.75. ‘Why don’t you move,’ you say? Because this is the cheapest place to live. They can’t afford to move. They’re stuck,” Kelley says. As a result, those who are stuck suffer long-term impacts to their health. With no respite from the pollution in the air, Port Arthur residents don’t spend too much time outside. One can drive around the town for hours and not encounter enough people to play a game of pickup basketball. For Kelley, this work isn’t purely altruistic. He has his own health problems related the environment, including chronic respiratory troubles and recurring rashes. And he speaks frequently of family members who have suffered and continue to suffer. From a cousin who died of a brain tumor as a child to another with lifelong breathing problems, not to mention uncountable friends and classmates who have died of cancer, lung disease, liver disease, and a litany of other diseases linked to petrochemicals, Kelley takes his work very personally. But he strives not to let his emotions interfere with what he needs to accomplish. Posted in CORPORADOES, ENVIRONMENTAL STRUGGLES, GUEST AUTHOR, LIES AND PROPAGANDA.